Dated c. 1474, the Leonardo da Vinci painting Ginevra de’ Benci was painted at a time when da Vinci was still an apprentice of Verrochio. The medium used was oil on 42.7 x 37 cm wood. Experts has debated for a long time as to whether it was Leonardo who painted the work, but the genius art can only be done by no other than da Vinci during the time around 1470 – 1480. The Florentine female portrait is the seventeen years old Ginevra de’ Benci who is an intellectual during her era. According to historians, the art was commissioned as an engagement portrait for the celebration her marriage to Niccolini. The background obviously shows the ‘leonardesque’ style of hazy sky, trees and mountains with a dreamlike atmosphere. This effect of the hazy sky was done through an overlay of oil glazes creating a thin curtain of mist. On the reverse side of the portrait is a design of a wreath palm and laurel encircling a juniper sprig with an inscription in Latin “Virtutem Forma Decorat” meaning “Beauty Adorns Virtue” in English. The juniper may either mean chastity or it may be some kind of a clever mention since the Italian name of juniper is Ginevra. The portrait is also thought to be commissioned by Ginevra’s friend Bembo, a Ventian Ambassador, for her marriage. This portrait of Ginevra shows the female with a marble-like skin and hair styled in ringlets framing a face portraying a sulky and proud facial expression. It is considered by many experts that this image illustrates Ginevra not being happy with the approaching marriage. Later in her life, Ginevra went into an exile on her will because of an illness and a love affair tragedy. 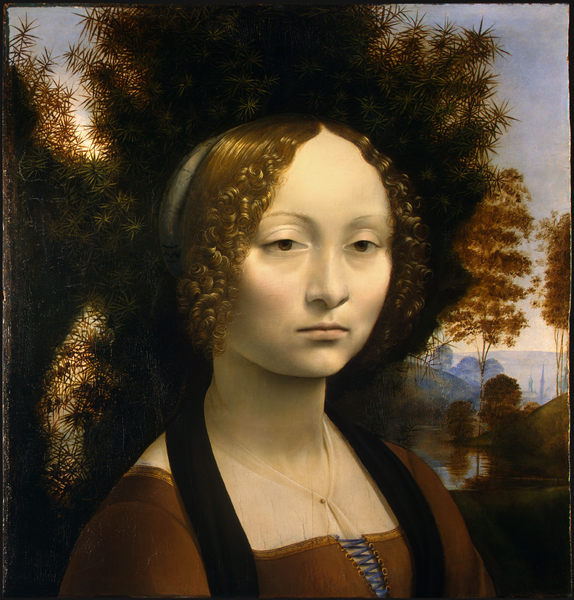 The portrait of Ginevra de’ Benci now sits at the National Gallery of Art in Washington D.C, being the first painting of da Vinci to be on an American gallery in 1967. Thank you for any other wonderful article. The place else may anyone get that type of info in such a perfect method of writing? I’ve a presentation subsequent week, and I’m on the look for such info.